I’m a big fan of Will Ferrell, and I don’t mind Zach Galifianakis (especially his early comedy routines where he played piano and just chatted about nonsense). I also love the ridiculousness of the American political landscape. So I had high hopes for this film. Ferrell plays Cam Brady, a North Carolina congressman about to (he assumes) begin his fifth term in office “representing” the good people of the 14th district of that fine state. For those of you familiar with Ferrell’s work, picture Ricky Bobby mixed with Ron Burgundy and dressed in a current businessman’s (or politician’s…because let’s be honest, they’re the same thing most of the time) wardrobe. It’s typical Ferrell, which is good if you like that, although this particular character won’t have you quoting lines to your buddies years down the road as previous Ferrell characters have. Brady has obviously settled into his congressional role of talking points, shaking hands and smiling at photo-ops and cashing his public-funded paycheque while not doing much for that public, and this introduction leads you to think that this film will say a lot about what needs fixing in U.S. politics. Just as Brady is about to accept another term as congressman, a dumpy, well-mannered — though quite strange — family man named Marty Huggins (Galifianakis) shows up at the courthouse to announce his candidacy, which is being bankrolled by billionaire brothers (quite obviously modelled after the Koch brothers). Huggins doesn’t realize that he’s being used by the corporate elites, and thinks his father — a long-time influential figure of some kind — has finally decided to let him join the political game to better the region. While I won’t go so far as to say that it’s a waste of time, I will strongly encourage you to wait until it comes out on video — or Netflix or whatever you use now that rental establishments are all but gone — to devote an hour and a half to it. I wanted to be able to say that it was a hilarious romp or a biting satire of the state of American politics, or both. 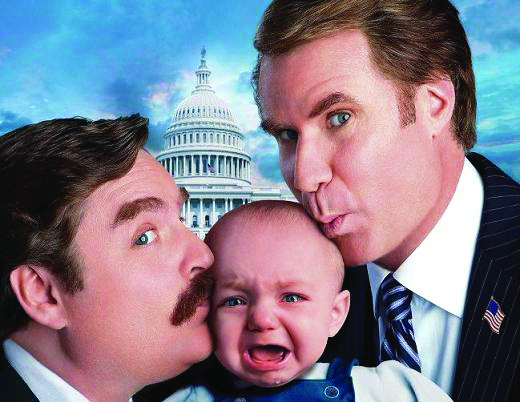 You would think that two comedic heavyweights like Ferrell and Galifianakis could enter the world of comedy gold that is the American political landscape, and have you holding your guts or leaving the theatre to catch your breath a couple of times, but I never even missed any jokes because I was laughing too hard at the last one. And vulgarity for no reason isn’t funny, nor is punching a baby in the face. Sure, there are some funny parts, and it makes some good observations about the electoral process south of the border, but overall, it’s just not quite hitting on all cylinders in either category. The characters are good and well-developed, but despite some great one-liners like Huggins’ father telling his son that he’s not likely to ever be proud of him because next to his brother, he “looks like Richard Simmons crapped out a Hobbit,” there just isn’t enough entertainment value in this film to warrant the ticket price that theatres demand these days. Too bad, too — there was a lot of potential here. This is one of the few Ferrell offerings I won’t have in my personal collection, but it was worth seeing once. Maybe in the upcoming Anchorman sequel Ron will run for office and Ferrell can have another shot at this? I doubt it, but we’ll see.